Dr. Patel is Chicagoland’s premier ACL reconstruction specialist, having performed hundreds of successful ACL reconstructions. During a consultation with Dr. Patel for an ACL injury he will examine your knee and your MRI and give you an individualized care plan and timeline. Dr. Patel performs anatomic ACL reconstructions allowing quicker rehabilitation, earlier weight-bearing and often doesn’t require bracing after ACL reconstruction. He has devised an efficient rehabilitation program to allow athletes of all levels (high school, collegiate, and professional) get back to competing at the highest level. Dr. Patel understands this may be a difficult time for you but will help you cross the finish line to a full recovery. The ACL, the anterior cruciate ligament, is the cord structure which runs centrally through the knee, connecting the femur to the tibia. The ligament is essential to knee stabilization, and often when it tears, it doesn’t heal well on its own, leading to a destabilized knee joint. ACL reconstruction surgery is a common procedure performed by orthopaedic surgeons to repair the ligament and return stabilization to the knee. Being an essential stabilizer of the knee, the anterior cruciate ligament is responsible for maintaining normal and healthy movement between the femur and tibia. When it is damaged, the knee cannot function appropriately, and patients who experience this injury will not be able to move as they ordinarily would. In ACL injuries, other structures such as the meniscus or articular cartilage can also be damaged, and in discussing ACL treatment, the treating doctor will explain how these can also be addressed during surgery. Most ACL injuries occur during competitive athletics when the knee endures a severe twisting or bending injury. However, the injury can also occur when the knee experiences a sudden change in direction, direct contact with another person, or landing improperly on the ground. Patients who experience an ACL tear will often hear a popping noise, which may or may not be accompanied with great pain. Swelling often follows the injury, and it is unlikely that the person who experiences this injury will be able to continue moving without difficulty. When checking for an ACL injury, the doctor will perform an examination to look for instability in the knee and whether there is discomfort specific to the injury. The doctor will more likely than not follow-up on the examination with an MRI, which will provide an in-depth and detailed picture of the knee joint. This will show not just damage to the ACL, if it is present, but damage to other knee structures, as well. However, the most definitive and final diagnosis will often only be able to be made during an arthroscopy. Initial ACL treatment involves typical rehabilitation procedure, which includes rest, cold compresses, elevation, and proper bandages. In the long run, it may be that not every person who experiences an ACL injury needs surgery; some people will benefit from repeated strength exercises or knee braces. Avoiding further injury to the ligament is considered most important, which may mean competitive athletics have to be given up. Further twisting or landing injuries can cause extensive damage and even contribute to early arthritis in the joint. People who experience ACL injuries and will usually opt for surgery include young people who wish to continue an active lifestyle or return to competitive sporting activities, and people with physical occupations. Before committing to surgery, the treating doctor will likely recommend stretching and strengthening exercises so that the patient experiences the best result possible. ACL reconstruction surgery is performed with an arthroscope. The doctor will remove the damaged ligament and drill holes into the bone so that a graft can then be placed inside. This graft most often comes from the hamstring tendon or the patella tendon. The exact graft that will be used depends on the doctor’s preference with reference to the specific patient being treated. The tendon developed from the graft will be held in place using special instruments and will usually heal within six months of the operation. Any other injuries the knee has endured can also be handled at the same time. After ACL reconstruction surgery, patients will leave the hospital the same day, although depending on the complexity of the procedure, it may be that some patients will stay overnight in the hospital. Braces may be used to compensate for any additional surgery performed, and the doctor or physical therapist will guide the patient on how to use crutches. The patient will be instructed on how to manage the dressings on the knee until the follow-up appointment with surgeon. Patients will generally be able to place full weight on their knee, bearing in mind they are careful with their movement. The treating doctor will recommend that physical therapy begin as soon as the patient is able. 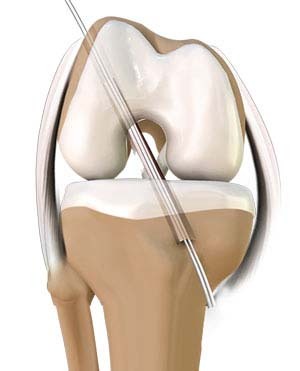 It is best that some amount of therapy begins before the procedure so that the knee is in a strong place early. The early stages of ACL rehabilitation will focus on range of movement, reducing swelling, and weight bearing exercises. Further ACL rehabilitation will include activities like biking, swimming, and muscle building exercises. Generally, it takes patients 2 months after undergoing ACL reconstruction surgery to begin cycling, 3 months to begin jogging, and after 6 months, when the graft is likely to be fully or nearly fully healed, more strenuous physical activity can resume. Patients involved in competitive athletics and serious physical pursuits may require 6-12 months of ACL rehabilitation before they are able to return to former usage of their knee. ACL reconstructive surgery recovery time will be dependent on the severity of the original injury, complexity of the procedure, and whether other structures in the knee were injured as well. It is important to remember that every injury is different, and that patience will be key in the ACL reconstructive recovery process. It will be recommended to use cold compresses often, be patient with movement, employ soft tissue massages and exercises, all with the aim of bringing knee extension back to full flexion by the end of the 2 weeks. Physical therapy commenced during this period will make use of exercise equipment which focuses on leg muscle strength, in addition to standing leg exercises like calf raises, leg extensions, simple squats, all with reasonable measure. In this later stage of recovery, patients will focus on rebuilding hamstring and quadricep strength that may have atrophied as a result of the injury and procedure. Focal hamstring loading will begin in this period and will progress steadily with the intention to return to full weight bearing activity. Active knee flexion exercises, single leg deadlifts, and bilateral bridge exercises will all be recommended in therapy. Toward the later stage of this period, patients may be able to begin running again. However, for this to take place, there must be no anterior knee discomfort and no knee effusion. Walking on a treadmill should take place for few weeks before jogging or running is considered. At this point, leg strength should have returned to the patient at or near a level held before the injury and procedure. Continued exercises will be recommended to bring the patient nearer to full return to their previous knee usage. In their exercise regiment, controlled sporting activities should be included to mimic real life usage. Increased loading on hamstrings and quadriceps will also be recommended, provided the knee has recovered to a stage that it can handle the weight. Full weight bearing, quadricep control, no effusion, and hop and turn abilities should be demonstrated before proceeding further. Again, complications with this procedure are rare but can happen. More than 95% of patients who undergo this procedure experience a successful result. It is best to have extensive conversation with one’s doctor before committing to the surgery and rehabilitation process. ACL reconstruction protocol entails all information regarding the procedure and potential risks are made available to the patient before scheduling the operation.